Wisdom teeth can cause all sorts of dental problems if not removed in a timely manner. Wisdom teeth are the third and final set of molars that emerge, usually during your late teens to early twenties. 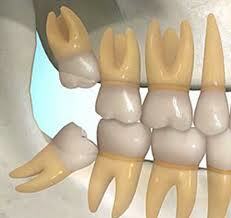 For some people the wisdom teeth emerge through the gums and have enough room to grow in naturally. For others, wisdom teeth often cause problems as they are trying to protrude through the gums. When a wisdom tooth is impacted the tooth is coming in at an angle and not straight through the gum line. Wisdom teeth that are covered by gum tissue that prohibits them from erupting are fully impacted and can cause an abscess. Ouch! Some wisdom teeth are partially impacted and part of the tooth emerges through the gum tissue. This is the perfect environment for trapped food, which may lead to decay and infection. For the wisdom teeth that do erupt, they often push and shove their neighbors out of the way! Not nice! These potential problems make it necessary to remove impacted wisdom teeth so that larger problems do not arise. Routine x-rays during a dental exam can reveal if you will need to have your wisdom teeth removed. To learn more about Wisdom Teeth Extractions or to find out if you’re a candidate to have them removed, Contact Us today to schedule an appointment.